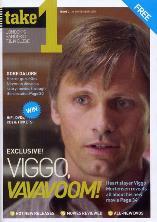 There is something very "other' about Viggo Mortensen. David Cronenberg, his director in A History of Violence, says that he was drawn to the actor because of this intangible something that could make him both a charismatic leading man as well as a quirky character actor. This otherness has made Viggo Mortensen not exactly a household name, rather more a scene-stealer of richly varied roles - Aragorn in The Lord of the Rings, the genteel doormat to Nicole Kidman in The Portrait of a Lady, Demi Moore's commanding officer in G.I. Jane, the con-man lover of Gwyneth Paltrow in A Perfect Murder. Now, in A History of Violence, his 40th film, he plays a small-town Middle American family man whose life changes when he thwarts a robbery. A History of Violence is a straightforward semi-Western and very noir story about a happy family and the thin barrier between normality and nightmare. 'It is an American Dream family that explodes,' comments the actor. In this deviously plotted tale of danger set against a warm, picture-perfect background, Maria (The Cooler) Bello plays Mortensen's lawyer wife whilst William Hurt and Ed Harris play baddies with a few theories of their own about his character. 'The character I play has been violent and the characters William Hurt and Ed Harris play correctly assume I still have that in me,' he says, 'but they make the mistake of assuming that I cannot change, that I have not changed. I don't think this movie is necessarily about the US or about violence per se. Violence is universal, it's a big factor of life in every country and this film, I think, says that violence exists and it's kind of futile to pretend it doesn't exist as long as there are human beings. But it also says that you have free will, that you can question your own actions and change the way you behave. I am very anti movies glamorising violence. One of my first questions to David was: what are you going to show? In the hands of a less gifted filmmaker, they'd have made a mountain out of the violence and shot it beautifully in slow motion and all that. But violence is not pleasant to look at and you'd have had a movie you wouldn't have thought very long about afterwards. David wanted to do something that showed violence that happens quickly, unexpectedly and has immediate, long-lasting consequences. Mortensen, 47 next month, is an actor, poet, painter, photographer, jazz musician and virtuoso horseman. He clearly doesn't feel that at home being interviewed and rubs a small blue tattoo of the letter H on his right hand uneasily. Most of the time as an actor, he says, one is alone and perhaps that's the way that suits him best. Born in Manhattan, he spent his formative years in South America, where his Danish farmer father managed ranches and farms. He later lived in Denmark and speaks English, Spanish and Danish fluently, and Norwegian and Swedish well enough. He has made films in Spanish and worked as a translator for the Swedish hockey team at the 1980 Winter Olympics. A familiar figure on the LA punk scene, he was married to Exene Cervenka, former lead singer of the band X, and he has a teenage son, Henry, who he says is his best friend. Mortensen's identity is rewardingly unclear-cut. He says he prefers it that way, exhibiting his photographs and paintings and writing books, playing music, far away from Hollywood, where he has worked on and off since 1985, when he made his first film, the Amish drama Witness with Harrison Ford.